This time’s entry is just a 78rpm playlist on that day – a kind of random pick-ups without consistency! 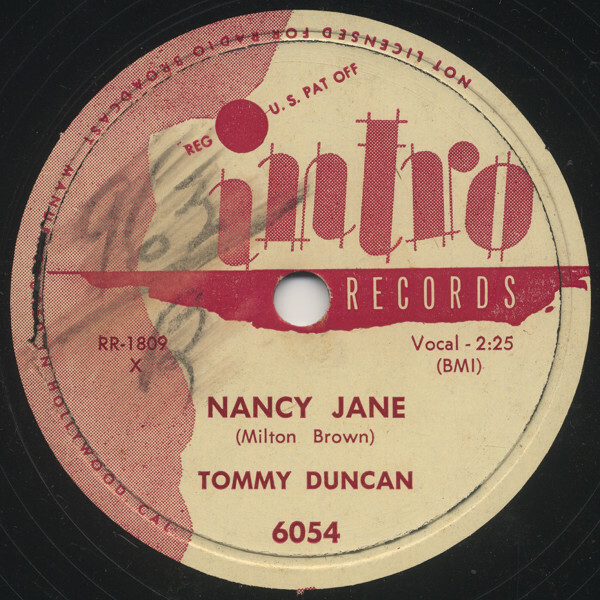 A good-sounding C&W tracks by Tommy Duncan (a great music partner w/ Bob Wills) with a bit of hilbilly-bop flavour – nice tunes – way to go, “Nancy Jane” ! Many of the Duncan recordings in this period (early 1950s) are often regarded as mediocre as he struggled and tried to catch up with soon-to-come Rock’n’Roll craze… but on the other hand it can also be said that such background adds some extra nuances to these tracks. and The Ranger Trio: Curly Roberts (vo, rh-g), Gene Bernard (vo), Toby Stiles (vo,b). 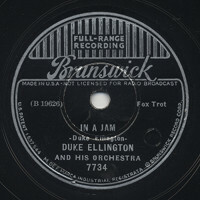 Recorded at Radio Recorders, Hollywood, LA on July 31, 1951. Curly Roberts (rh-g, vo), Gene Bernard (vo), Toby Stiles (vo, b). Recorded at Radio Recorders, Hollywood, LA on November 19, 1951. 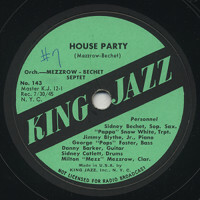 The next 78rpm here is from King Jazz label, which Mezz Mezzrow (he plays on these sides of course) started in 1945. 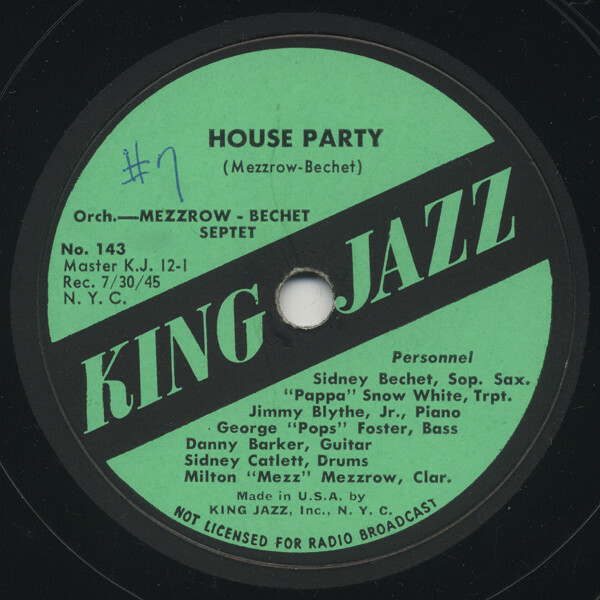 Among all excellent King Jazz releases this 78rpm would be one of the top-notch and really moving, as here plays superb Jazz players who all shed light on great old bluesy style again to spark the New Orleans revival. Sammy Price (p), Danny Barker (g), George “Pops” Foster (b), Sidney “Big Sid” Catlett (ds). Recorded at W.O.R. Studios, New York City on July 30 1945. 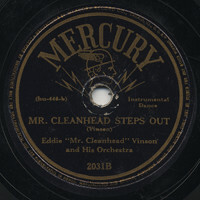 The mood dramatically changes on the next 78rpm, recorded in 1945 too, is by Eddie Cleanhead Vinson – I love his stylish, clean (but also deep & heavy) also saxophone so much, as well as his bluesy-shouting vocal. The Side-A, “Juice Head Baby”, is a typical Vinson-style R&B shouter with excellent band arrangements. The flipside an interesting jazzy R&B instrumental, Vinson playing honking-like saxophone. Love this! Earl Van Riper (p), Leonard Swain (b), Gus Johnson (ds). Recorded in New York City, late 1945. 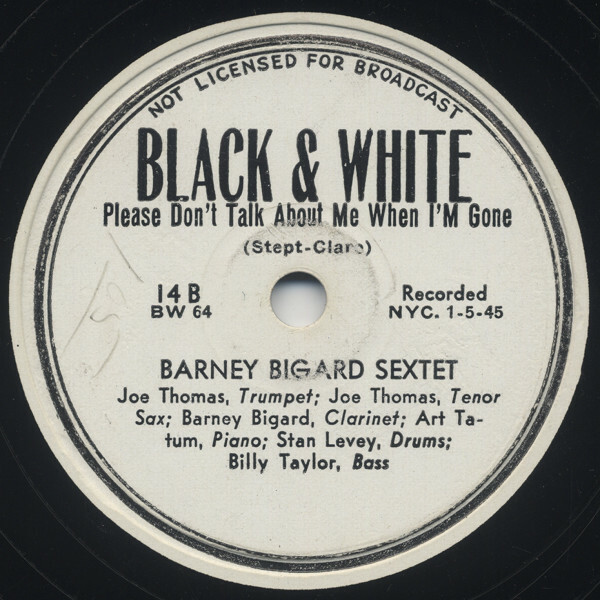 Next 78rpm choice is Barney Bigard Sextet from the Black & White label – featuring one of my favourite trumpeter Joe Thomas. 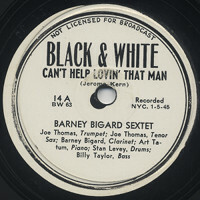 Interestingly enough, a tenor saxophone player on this session is also named Joe Thomas – the name “Joe Thomas” is credited twice on the label. 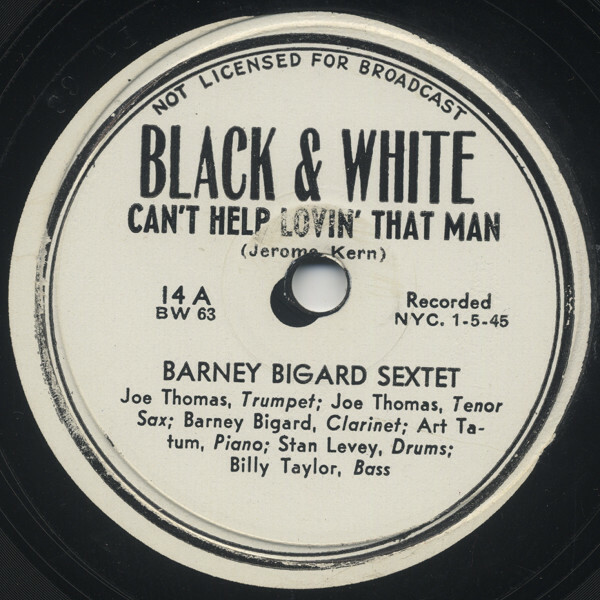 Side-A “Can’t Help Lovin’ That Man” is a breezing ballad featuring Joe Thomas’ beautiful trumpet, while the flipside “Please Don’t Talk About Me” is a swingy number with stomping conversation between two Joe Thomases. 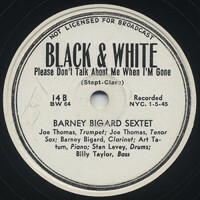 On both tracks, the leader Barney Bigard’s clarinet and the maestro Art Tatum‘s marvellous piano solo are fully featured. Art Tatum (p), Billy Taylor (b), Stan Levey (ds). Recorded in New York City on January 5, 1945. 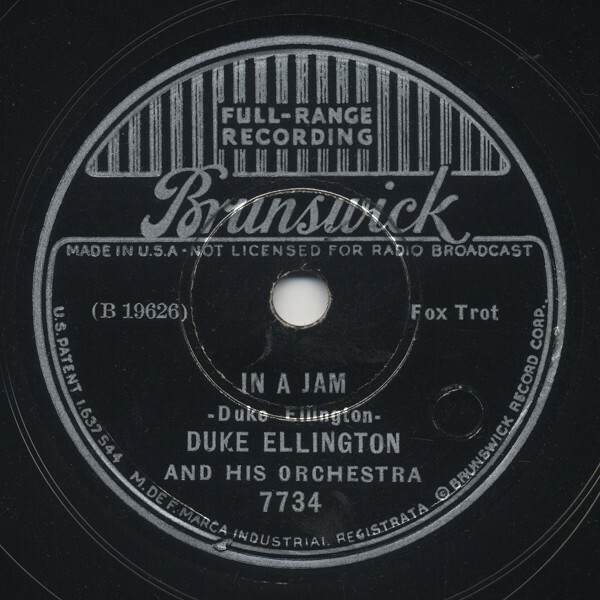 Today’s last choice is “In A Jam” by Duke Ellington and his orchestra – what a catchy riff, great solo after solo by all-established players. What’s more, how attractive Sonny Greer plays hi-hat as an accent… definitely one of my favourite performances! 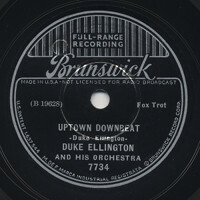 Duke Ellington (p), Fred Guy (g), Billy Taylor (b), Sonny Greer (ds). Recorded in New York City on July 29, 1936.
and tagged 1936, 1945, 1951, 78rpm, Black and White, Blues, Brunswick, Country, Duke Ellington, Eddie Vinson, Intro, Jazz, Joe Thomas, King Jazz, Mercury, Mezz Mezzrow, Sidney Bechet, Tommy Duncan. I, too, have been unable to find much out much about HUB Records. 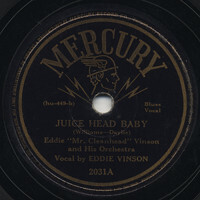 MERCURY Records apparently assigned the HUB mx#s for each of these: Juice Head Baby hu-449-b; Salt Lake City Bounce hu-446-b. Classic Capitol Jazz Sessions (CD) #0170 (MOSAIC Records) has Juice Head Baby showing musicians that differ from your information (in light blue box). I myself would rely on Mosaic’s discography. Cootie Williams and His Orchestra: Cootie Williams, E. V. Perry, George Treadwell, Billy Ford, Clarence “Gene” Redd (tp), Ed Burke, Dan Logan, Bob Horton (tb), Rupert Cole (as), Eddie Vinson (as, vcl), Sam Taylor, Lee Pope (ts), George Favors (bari), Arnold Jarvis (p), Carl Pruitt (b), Sylvester Payne (d). I have no further information about Mr. Cleanhead Steps Out. Maybe your discography is for it. 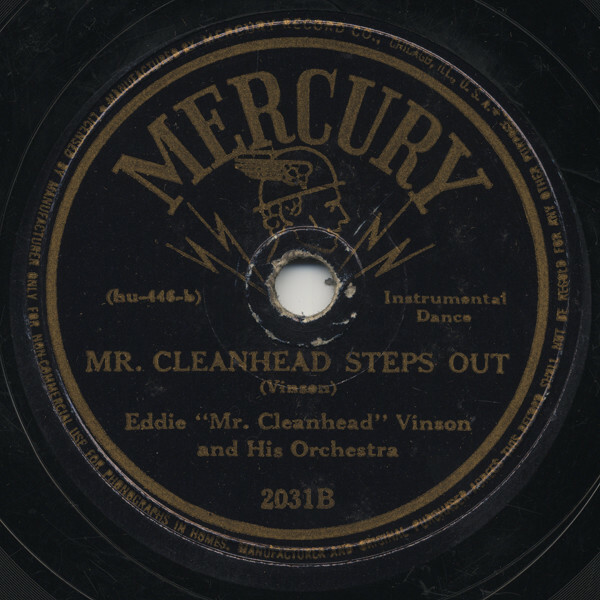 MERCURY Records assigned mx# hu-446-b to Mr. Cleanhead Steps Out. The mx# for Salt Lake City Bounce, as you can see, is 665-4. I will be able to present some further information about HUB Records, Inc. soon. Thanks Levy-san for further info! Any info about HUB Records would be appreciated by many collectors and researchers!